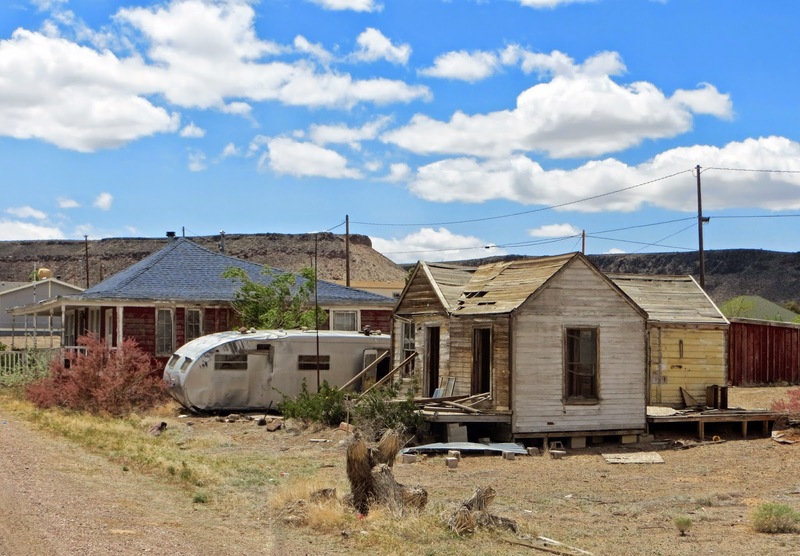 A few dilapidated houses on the main drag in Goldfield, Nevada. Goldfield was a boomtown. In the early 1900s it had over 20,000 residents. By 1950, it had 275. Today, there's not much more than that, with the population hovering around 400. Gold was first discovered here in 1902, and by 1904 the Goldfield district produced enough gold to make up 30% of the entire state's production, valued at $2.3 million dollars. The town didn't just have gold and money, they had outlaw lawmen - Wyatt and Virgil Earp lived there. Virgil was the deputy sheriff in 1905 but then contracted pneumonia, and after being ill for six months, died in October of that same year. Wyatt Earp left shortly afterward. I kinda like the old ghost town feel of places like this and often envision stepping out of the truck and catching a glimpse of a gold nugget that someone overlooked. It can happen, you know. People still do look for gold there. With a (Bart) Simpsons sky.